You may not be aware of this (not many people are), but at the moment the council’s scrutiny committee is reviewing the waste system in Birmingham. Birmingham currently asks its residents to put black bags full of rubbish, including food waste, out on the streets every week with recycling in open boxes collected every 2 weeks. On most streets around the city, this means that by the time the lorries arrive to collect the stuff we put out, bags have been ripped open by rats, birds, foxes or cats and on windy days (like recently) the recycling is blowing all over the street. In many other cities there is a better system where food waste is collected separately in sealed bins meaning vermin cannot get to it. Then it is taken and composted or put into a machine called an anaerobic digester that turns it into gas to be used in the grid or for generating electricity. The prices of resources such as paper, cardboard, metals, plastics and all kins of fabrics is going up all the time, but at the moment we are sending tonnes of these to an incinerator where they are burnt and fill the sky with harmful gases. Councillors this week have received information about the waste review and have the opportunity to put their views into it. If you contact your local councillor and let them know that you feel strongly that you want a change to how rubbish is collected in Birmingham, now is the time to do it. The council is not great at consultation – have you ever been asked what you think would be the best way to collect your rubbish? Why don’t you take the initiative and tell your councillor what would work best on your street? If you don’t we may just carry on with the same dirty inefficient system. i shall write to my councillors now you have raised the issue of recycle. I have put a written question to Cllr tim Huxtable to ask why when Christmas is Annual Event we are always let down by the lack of waste collection. I will let you know the responce tomorrow. i couldnt agree more, well done cllr, after all its not a surprise is it. Xmas day =25th dec= more rubbish than normal. QED you plan for it….or not… as happened in our road this year!result paper and cans everywhere following the storms. waste collection 2 days late recycle 10 days late. I can probably give you a more honest answer to this question, under normal circumstances Xmas Day and Boxing Day is our only two days official holiday all other bank holidays are worked, as acknowledged by other posters there is a far larger volume of rubbish during this period and we previously received a small clear up payment to acknowledge the extra efforts required. This was withdrawn this year and this alongside B.C.C s refusal to pay agency staff who incidentally make up approximately 40% of the workforce any extra pay for working bank holidays meant the service was undermanned as many chose to spend the time with their familys instead. These agency staff receive the princely sum of £6.08 an hour would you honestly expect them to work bank holidays for this rate? if its not too late, could you also ask why we do not get wheely bins to help keep our streets tidy, bin bags are not up to the task. Also at what cost is it to send around a street cleaning vehicle to clean the spilled waste off our streets? 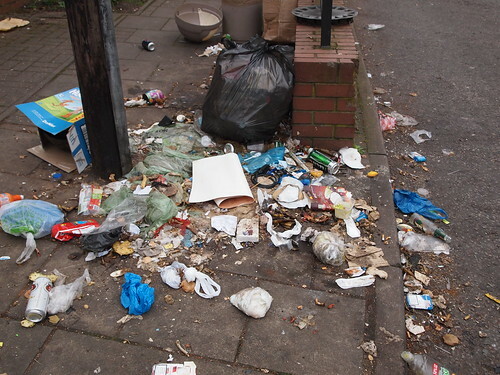 We want to keep our streets tidy, but we cannot if we dont have the correct tools to do the job from BCC. Simon – Elmdale Cresent, Northfield. Up until Dec last year I lived in Rugby and now live in Rednal. We had 3 wheelie bins. One for general waste, one for recycling and 1 for garden and food waste. Its a very simple system and keeps the animals and elements out of the bin bags. We’d also use fewer bin bags and it’s safer for the bin men than handling black bags which might be full of god knows what that could pierce through the bag. The waste collection in Birmingham seems like a joke compared to Rugby. my son works at Comet and he is expected to work bank holidays for min wage as do many retail shop workers. Not saying right or wrong just saying thats how it is.